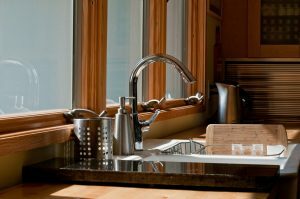 While it might seem like a daunting prospect, replacing a faucet is a simpler home improvement addition you can do yourself at home with just a few tools, some know how, and a lot of patience. In this article, we’ll explain the steps required to take out the old faucet and how to install the new faucet for your sink type. Believe it or not, one of the most challenging aspects of replacing a kitchen faucet is removing the old one. Unexpected difficulties can arise from corrosion in the pipes and fittings, difficult to reach nuts and strange fittings can quickly test even the most patient person. But if you keep your wits about you this job can typically be accomplished in about an hour. The first step is to make sure the water supply to your sink is turned off. Usually, this can be accomplished by turning the two fittings underneath your sink clockwise until they are snug and water no longer runs from both the hot and cold water valves. This can be tricky, however, if the valves haven’t been turned in a while. The rubber seat inside the valve can dry out or become clogged with minerals and lime. This is why it’s always a good idea to turn these valves a couple of times a year to break up any build-up. If you’re having trouble with these valves, there are a couple of options. You can grab some channel-lock pliers and gently try and turn the valve in a clock-wise direction. As things begin to break up and loosen, turn the valve back and forth until you can easily turn the valves closed. There are also penetrating oils that you can drip down the shaft of the valve. Tap the body lightly with the back-end of a screwdriver to allow the oil to distribute around the valve and soak into tough spots. If the valve begins to loosen, you can continue to add more oil until things fully open. Now, it’s time to clear out the dusty cleaning products and trash bags that have piled into the dark underbelly of your sink, and climb in. Use an adjustable wrench and a pair of pliers to disconnect the hot and cold water supply lines that are connected to the faucet. If you find that these supply lines have seen better days, consider replacing them with newer ones. Next, use a basin wrench to remove the mounting nuts holding the faucet in place. With the mounting nuts off, lift out the faucet and use an adjustable wrench to disconnect the sprayer hose if you have one. With everything removed, now is a good time to clean the sink surface of the faucet with a scouring pad. Make sure you buy the correct faucet for your sink type. The number and distance of the holes will determine the type of sink you have, and how to match it to your new faucet. Typically, a sink has anywhere from one to four holes. Make sure to measure the distance from hole to hole to ensure the faucet will fit. With any luck, the new faucet that you’ve purchased will have instructions that will give you a general sense of where everything is positioned. With everything cleaned and removed, it’s time to install your new faucet. The first step is to position the main spraying hose with the sprayer hole (if you have one). To save yourself some hassle, make sure you connect the spray hose before you fully set the fixture in place. Once that’s done, you’ll need to attach the hot and cold water supply tubes to the shut-off valves. Hot water connects on the left, and cold connects on the right. Make sure the faucet fixture is now properly mounted and sealed to the sink. Test the water by turning it on. If you find any leaks, make sure the connections on the supply lines are tight and sealed. That’s it, you’re done. Now it is time to enjoy your new faucet!